When I was a little girl, I loved going to my great aunt’s house on Christmas Eve. She was elderly and lived alone, and during most of the year her house smelled like moth balls. Christmas Eve at my Great Aunt Barbara’s house was magic. I never could figure out how she did it. Looking back now, I still wonder. In my memory, Aunt Barbara was a slow moving woman with gnarled fingers and deep wrinkles around sad grey eyes. She still lived in the old Victorian house where she grew up and in which she raised her own family. By the time I came along, her family was already grown and scattered far and wide in different states, and her husband, my great uncle, had already passed. Year after year, my mother would drive us two hours to visit her at least once each month to check in on her and keep her company. The house was way too big for her. As she aged, she really only used a couple of rooms on the first floor. Most of the house was shut off to us as kids so her things wouldn’t be disturbed and so that we wouldn’t get hurt in the old creaky house with sticky doors and splintery wooden floors. We’d sometimes sneak upstairs and peek into some of the rooms, but they were so still and dusty and uninviting that we wouldn’t even want to go in. In the parlor off the main entrance, she would greet us with a shaky tray of tea, milk, and stale cookies. We were expected to sit with her while she and our mom conversed about relatives we barely knew, about the neighbor helping with the storm windows, and about other grownup things like that. My brother and I would try to sit still on the floral arm chairs or the high backed sofa while they talked, but the old springs would pop up at our bottoms until we’d finally slip over to the small fireplace behind Aunt Barbara’s favorite chair. We’d stare at the empty andirons, dreaming of the warm fire that would be there on Christmas Eve. And then, the day finally came. 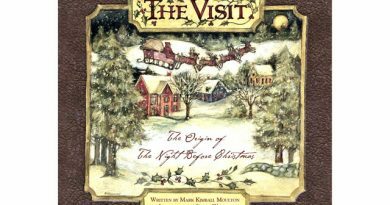 That Christmas Eve, like every Christmas Eve when I was young, started with my mother’s voice calling out, “Come on, Kids! 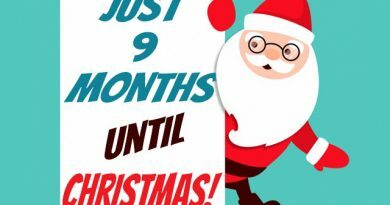 It’s time to go to Aunt Barbara’s!” No hiding in the closet for me on that day! We raced to the car eager to get on the road, even knowing we still had two long hours ahead of us to wait and anticipate. After two hours of singing every Christmas song we could think of, we arrived at her house. On that day of the year, it was no longer “Aunt Barbara’s house” but “The Santa House,” and we couldn’t wait to get inside. The outside of that vast white Victorian was never overly decorated for the holiday, but we were excited to see the warm yellow candles glowing in every window on every floor. Above each candle hung a bundle of green pine sprigs tied with red ribbon. 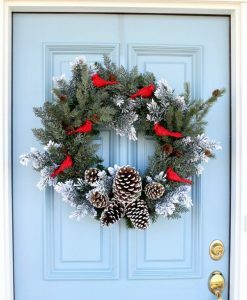 On the front door hung a beautiful Christmas wreath, different each year. The wreath always made the brass knocker stand out. Every other year I got to be the one to strike the knocker. Tap tap tap. My brother and I held our breaths as we pressed our ears up against the white washed door. We could hear her in there. Aunt Barbara was giggling, just like every Christmas Eve. It was such a lovely sound. “Ooh! They’re here!” she muttered giddily to herself, and then she sang out, “I’ll be right there!” We could hardly stay still, waiting for the door to open. When the door creaked open, we let out squeals of delight. There she stood, clad in her bright red velvet Mrs. Claus suit, wearing jingle bell earrings and bright red blush on her cheeks. Her grey eyes sparkled like diamonds as she pulled us in with an energy we only saw in her on this day. She helped us out of our coats and then began her tour, taking us from room to room all throughout the house to show us her enormous collection of Santas. Santas were everywhere. Old fashioned, new fashioned. Tall ones. Tiny ones. Round ones with twinkling eyes. Silly skinny ones with extra long beards. Velvet clad Father Christmas. Singing and twirling Mr. & Mrs. Claus. 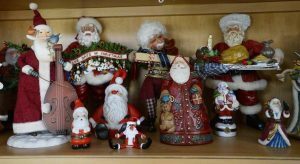 Every last one of the Santas was displayed with both care and whimsy, accented by garland and holly and oh so many candles in every room and in every nook and cranny of that way too big house. Cinnamon and vanilla floated in the air where the smell of mothballs normally hangs heavy. The dining room table was set with a bright red tablecloth and candles that flickered from their silver candlesticks. 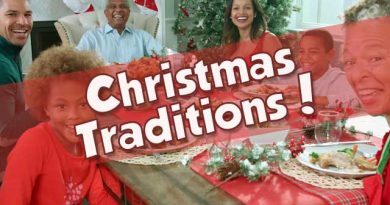 Silver platters spilled over with fresh baked cookies shaped like stars and pine trees and Santas and gingerbread men, all shining with colorful icing in the dancing candlelight. Aunt Barbara poured us some apple cider, and she and mom smiled as we helped ourselves to cookies. Aunt Barbara’s face was so lit up watching us. 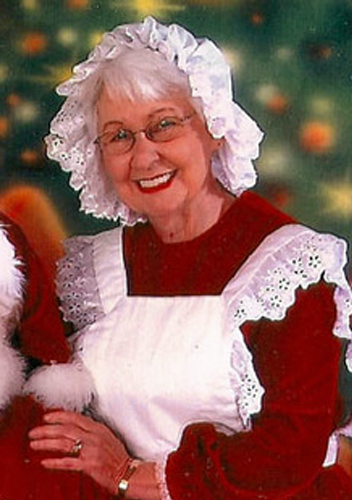 She never once said a word as we stuffed cookies into our pockets to take with us on the rest of our Santa tour. When it was time to go up to the second and third floors, she let us go on our own, as her legs were getting tired and she would need a break. 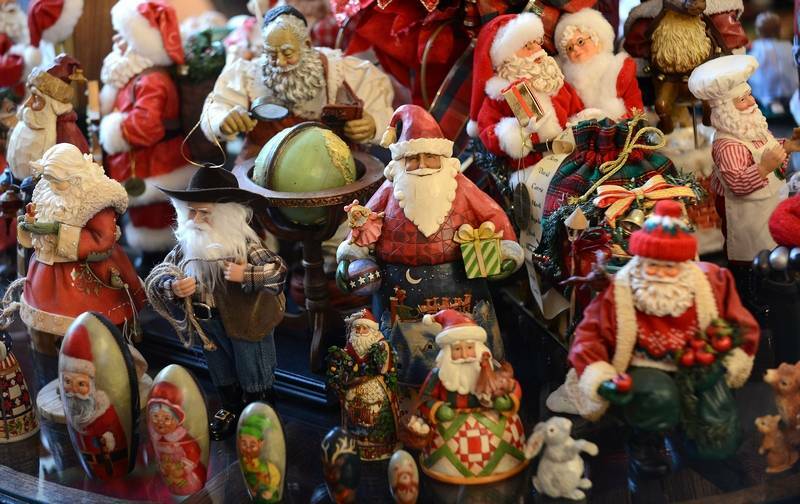 She told us to take a good look at every one of her Santas and then come down to the parlor where she’d be waiting. When we were all done oohing and ahhhing at all her beautiful Santa’s, we made our way down to the parlor. She sat in her favorite chair, now pushed to the side of the fireplace where the coziest of fires crackled warmly. She directed us to settle on the large Santa quilt she spread in front of her little fat Christmas tree. Then, in keeping with her yearly tradition, she took out her copy of ‘Twas the Night Before Christmas and read to us as we stared into the fireplace with eyes full of wonder and bellies full of cookies and cider. Before she finished the poem, we were be fast asleep. In the morning when we opened our eyes, we discovered we were still be in that parlor, with the large Santa quilt under us, and another one on top of us, surrounded by that lovely fat Christmas tree, brightly wrapped presents, Mom and Aunt Barbara, and Santas, Santas, and MORE Santas.